Windows Cannot Install Required Files – Windows 10 comes with many advantages and profits but sometimes it is one of the toughest systems to update due to the many errors during the installation. There are so many errors in this, but the most commonly found error is 0x8007025D. 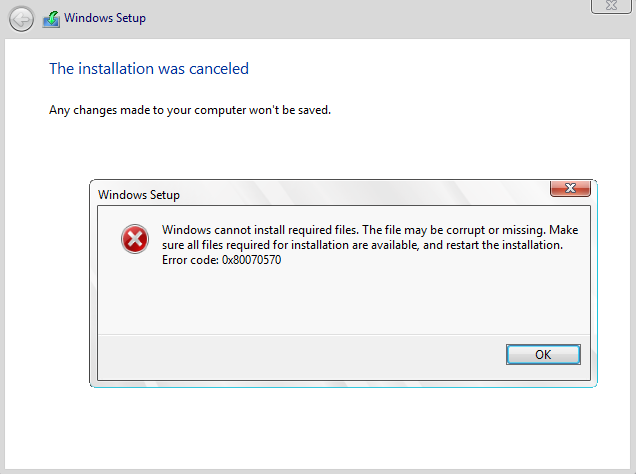 This error prevents the installation after a certain percentage. This error gives the notification that “Windows cannot install required files”. In this error, files and data may be unavailable or corrupted, you will need to ensure that all required files are available for installation. So, here we are giving the details about the reasons for this failure error and the solutions to solve or fix ‘Windows cannot install required files’ error. 0x 8007025 error (0x8007025D = ERROR_BAD_COMPRESSION_BUFFER =) is known as poorly formed data in specified buffer. To communicate with the system, USB 3.0 uses Message Signaled Interrupt (MSI) mode. The MSI system, which uses USB 3.0 devices, is characterized by that it provides unlimited handling of data transfer between device and system. Data is streamed at high data rates through a buffer and decoded by the system. But if your PNY device sends bad or malicious data to the buffer then you get the 0x8007025D error in the Windows system. This also happens because the buffers of the system are pressed or the devices are unable to decode data properly. Corrupt data on USB drive means that data can not be decoded properly. To create a USB drive, the ISO image file is bootable. A bad flash drive, and if the copied file is missing or corrupted, then this error may arise. Here we are providing some reasons for the windows cannot install required files error issue or error 0x8007025D. We will also discuss these issues in below. There are so many facilities that help check the health of the hard drive and the list of parameters is also quite long. If the diagnostic software generates a disk error on your system, then it is possibly 0x80070570 error. If you want to position the error and you can not launch the diagnostic tool. In this case, you have to remove the disk from the PC box and connect to another PC. You must replace or format the device if the 0x80070570 error is due to hard drive failure or file system failure. If the data stored in your disk is important then you have to recover it by using the data recovery software (ReclaiMe File Recovery) before changing or formatting. Often the 0x80070570 error is caused due to RAM failure or a bad RAM. If there are more stores in the ram then clean installs do not fight for space with other programs. But a small corrupted or bad segment of RAM can also cause 0x80070570 error problem. You need at least 1GB of RAM so that you can install Windows 10 on your computer. But if given in the bad segment of your Rome is copied, buffer technology will get an error on your screen. It is easy to find out that 0x80070570 error is caused by damaged windows files. You are starting to get an error immediately after you restore or update an operating system and OS on your computer. Windows install to try to copy files on the bad area or record of HDD or SSD. And you see error 0x8007025D displayed on your computer screen. To find a solution, you have to type the solution to the boot file once again. If the data stored on the device is important, then you need to copy it to a safe location. After you retain and secure all valuable data, you can reinstall the operating system. Steps to fix Windows cannot install required files / 0x80070570 Error. Here you will know about the steps to solve this error from your windows 10 system. These steps are very easy to follow. So, please check and solve 0x80070570 Error from your system. 1. First of all, you have to disconnect the disc from the system’s motherboard. 2. Now anyone sucked a sat-to-USB adapter. After this connect the disc to any other PC. 3. Now download and install ReclaiMe File Recovery Software on your system. Note: Do not make the mistake of installing ReclaiMe File Recovery software on a device from which you will be recovering the data. 5. Now, click on Start and let the software scan complete. 6. Next, use the preview function to check the recovery quality. 7. Prepare the device with which you will copy the recovery data. 8. Now connect it to the computer. 9. You can format the disk and reinstall Windows as soon as your data is copied to a secure location. Finally, We Share Methods to Fix error 0x80070570. If You have any method then Share with error facing the user and help them to fix this error. If You are satisfied with all these methods then Comment us below in comment section and Share with your friends and family Member on social media.